For all those clients asking us for information about shuttles from Liberia Airport to Santa Teresa, the answer is yes we do offer them. Tropical Tours Shuttles provides daily shared shuttles in our minibuses from Liberia Airport twice per day, we leave at 08:00 am and 03:00 pm heading to Santa Teresa from only $50 per person, It’s a 5 hour ride from Liberia Airport LIR Terminal in Costa Rica to Santa Teresa in Puntarenas, Costa Rica View Map. Take that in mind if you’re leaving from Santa Teresa to Liberia to catch your flight on time, otherwise you can stay the night before and we can recommend you a place to stay in Liberia town. Also Montezuma, Tamarindo, Samara and Nosara are part of our list of destinations in Costa Rica. In case you need a private shuttle we are able to provide it for $270 (price per way) from 1 up to 6 passengers. After that there is an extra charge of $20 per person. We flew into Liberia and travelled down to Santa Teresa. First off, the service was so accommodating. We scheduled the wrong day, and they changed dates for us without any problems. Then, when our shuttle arrived, the drivers were excellent in helping us out (we have two kiddos, 1 and 3). Our mid-trip stop was perfect at a great little cafe. We were so happy to have booked with Tropical Tour Shuttles. The made the trip a total breeze! Excellent shuttle experience from Liberia to Santa Teresa! Tropical tours communicated so well, pick up was a breeze in Liberia. Drivers and staff were all friendly and helpful. We will definitely be using again to get to Montezuma. 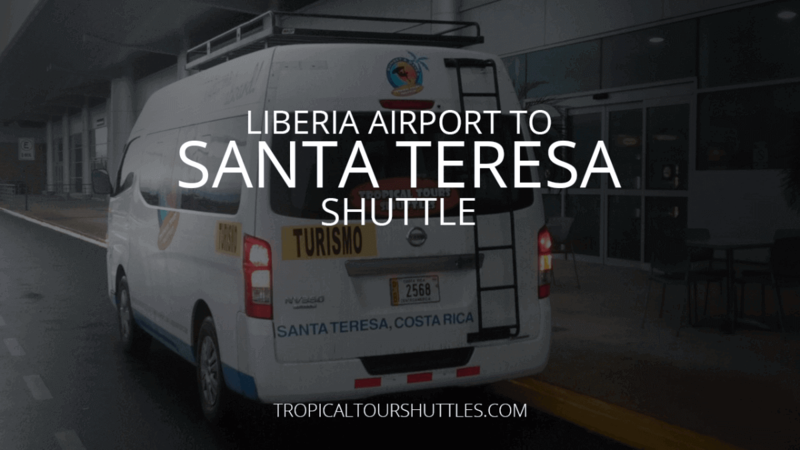 Tropical Tours picked me up at the Liberia airport and took me to Santa Teresa. They were prompt and professional, connecting with me immediately at the airport and getting me safely to my destination. My friend and I also used Tropical Tours at the last minute when we were leaving to go back to San Jose and our other shuttle arrangement fell through. I would definitely use them again on my next trip! This is my second experience using Tropical Tours. It was easy to book the reservations on line and the office got back to us within an hour to answer all questions and set up the reservations. I found the drivers to be helpful and courteous. They did their best to make us all comfortable and happy on a four hour trip from Liberia airport to Santa Teresa. Would definitely use them again the next time that I am in Costa Rica. Thank you Manny for an enjoyable trip this last time. We used the private van service from Liberia to Santa Teresa, Costa Rica. 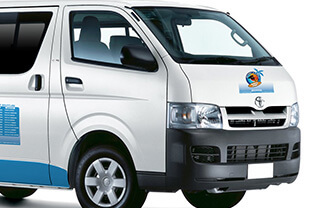 They were on time, provided comfortable and clean van, polite and helpful driver. We would definitely use them again on our next trip. Tropical Tours Shuttle service is the ONLY one that has afternoon service from Liberia Airport to Santa Teresa on the Nicoya Peninsula. We used them for four different shuttles during January 2018. They are run by the nicest people and let me tell you why. My son-in-law left his cell phone on the van and thought he would never get it back. The driver was not working the following day but called the Santa Teresa office and they let us know it was found. He brought it back to Santa Teresa and returned it the following morning. A few days later, I had an emergency and my husband and I were flown to the hospital in San Jose. We booked Tropical Tours shuttle to go back to Santa Teresa and said we would get a cab to San Jose airport to meet the shuttle. Tropical Tours said they would pick us up at CIMA Hospital at 8 am in the morning. We were thrilled that they we didn’t have to meet them at the airport. The driver was at the hospital at 7:30 am, so he came to my hospital room and helped us out. We highly recommend Tropical Tours Shuttle for these reasons as well as the fact that they are the most courteous and cheerful drivers ever. The shuttle was there, on time, at the airport and it was very easy to find them. The driver was very chatty and friendly. The van was comfortable w A/C and wifi 🙂 I’m glad I chose to go through a reliable company because the road can sometimes be quite sketchy. The driver, Marlon, knew the (longgg) road perfectly and not a single time did I feel scared. Would definitely choose them again! Our driver was really friendly and helpful. Smooth ride and flexible with our time of departure. Best way to get from Liberia to santa Teresa for sure. We used them to get us roundtrip from Liberia Airport to Santa Theresa and back. Excellent service – on time for both pick-ups and they were helpful and professional. I highly recommend them. I used tropical tours twice. I took a private shuttle with my girlfriend from Liberia airport to Playa Carmen (typically about 5 hours). Since it was the two of us, the driver offered to take us on a shortcut. We managed to get to Playa Carmen in 4 hours which was fantastic. The route was scenic (and quite bumpy at parts) but our driver was nice, pointed out some cool things along the way, and was willing to stop whenever we needed a break. It was expensive for 2 people but our flight landed at 12 and the next group shuttle wasn’t worth waiting 3 hours for. In the end, we got to our destination about 5 hours before the group shuttle would have, so I consider it totally worth it.